Many people recognize Arabic calligraphy for its beauty. And oriental rugs are Islamic art in themselves. Here I show my little collection of Islamic art, squared: oriental rugs with Arabic calligraphy. These pieces are for pure art, and have no utilitarian intention. The wording of Allah and other reverend texts from the Qur'an on them necessitate that they be on the wall for admiration or even worship. Although I'm not a Muslim, I acknowledge both values: as religious pieces of the Islam, as well as beautiful pieces of art. "faAllahu khayrun hafithan wahuwa arhamu alrrahimeena." But Allah is the best Keeper, and He is the most Merciful of the merciful ones. 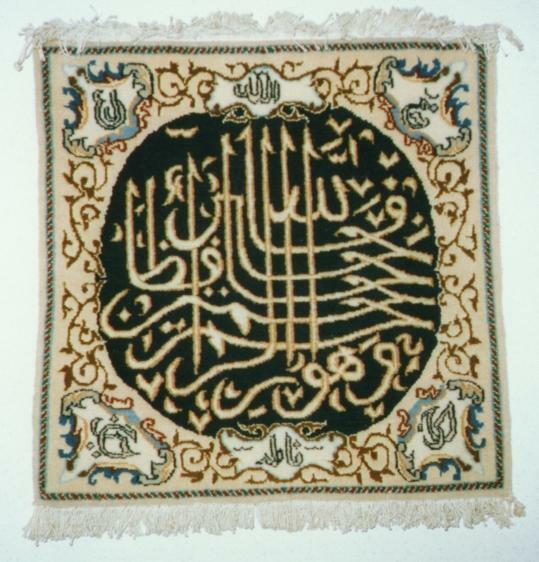 This text is from the Qur'an, Surah Yusuf (12), verse 64, surrounded by the names of Allah (God, above centre), Mohammed (God's Prophet, right-upper corner), Hassan (Fatima's son, right-lower), Fatima (Mohammed's daughter, below centre), Hussain (Fatima's son, left-lower), and Ali (Fatima's husband, left-upper corner. 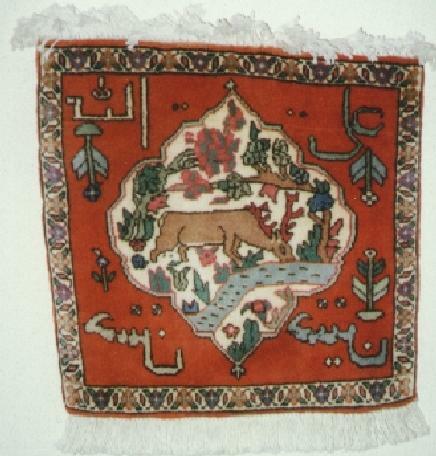 Mentioning these names is characteristic of Shii Muslims, supporting the Iranian provenance of the rug. Calligraphic Rug, probably Nain, Persia, approx. 1960, wool on wool warp, 0.45m x 0.28m. In the name of Alla, the Compassionate, the Merciful. And those who disbelieve would almost smite you with their eyes when they hear the reminder, and they say: Most surely he is mad. Also a Qur'an text, Surah Al-Qalam (68), verse 51. 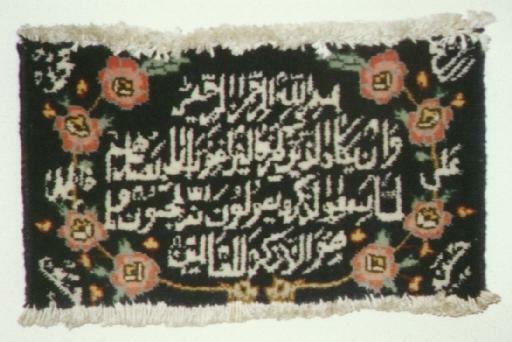 Again the text is surrounded by the names of Allah (right-upper corner), Ali (right-middle), Hassan (right-lower), Mohammed (left-upper), Fatimah (left-middle) and Hussain (left-lower corner), supporting a similar provenance as the above rug. Pictoral Rug with calligraphy, Bijar, Persia, approx. 1940, thick wool pile on cotton warp, densely knotted, 0.50m x 0.50m. The four names are Allah in the top left corner, and Ali the son-in-law and successor of the prophet Mohammed, in the top right corner. In the bottom corners the names of Hassan and Hussain, the two sons of Hazrat Ali, and therefore the grandchildren of Mohammed. The bottom text images are mirrored horizontally, probably because the illiterate weaver did these texts from the backside of the rugs. Note that the four texts are in three distinct scripts. Offers of equivalent calligraphic rugs are kindly invited. I would highly appreciate it to be able to extend my collection. Please e-mail me at WvD@clifton.nl, or use the Contact Us form in the upper-left corner of the screen. With special thanks to Walid Abdel Wahed for providing the excellent leads for the Qur'an references, which facilitated appropriate transliteration and translation, and to Murtaza Abbas for providing information on the various names.